Last week, the Burlington Chamber Orchestra landed the kind of holiday gift every arts organization would love to receive: a $10,000 National Endowment for the Arts grant, which will fund BCO's Music for Minors program. The grant will have "a huge impact," says board president Christina Brooker, given that the 35-member ensemble has an operating budget of just $55,000. Now in its eighth season, the orchestra is "finally at the point of growth where we can handle [the grant]," Brooker says, "but we're small enough that it makes a big difference." Called a Challenge America grant, the fund supports efforts around the nation to bring the arts to underserved populations; 163 organizations won it this year. BCO has been reaching such audiences through an annual music-education visit to the Shelburne Community School's band in advance of the ensemble's spring concert. BCO also provides students and their families with free concert tickets, potentially drawing in new audiences. The grant will allow BCO to visit more schools and hand out more free tickets, on which the ensemble previously took a loss. It will also aid in the maintenance of two more Music for Minors programs: the Young Artist Solo Competition and the annual commission of a new work by a student composer working through Music-COMP, the Vermont-based online composition mentoring organization. The winning soloist and chosen composer accompany the BCO on school visits; at the spring concert, the soloist performs and the composer gets to hear his or her piece premiered by professional musicians. Music-COMP executive director Sandi MacLeod says that, while 12 Vermont musical ensembles regularly call on the organization for new student commissions, BCO's program is the only paid one. MacLeod and senior mentor Erik Nielsen have already selected this season's composer, Saigelyn Green, a senior at North Country Union High School in Newport. The BCO will begin assessing applications for its soloist competition in February. Finally, the grant will help fund a guest conductor for the spring concert. The BCO has been without a dedicated conductor since its founder stepped down in 2010; a musicians' committee of six resident players makes artistic decisions and invites guest conductors for certain concerts. Vermont Symphony Orchestra principal flutist Albert Brouwer conducted the November concert. Violinist Soovin Kim and University of Vermont assistant music professor Yutaka Kono, a tuba player, have also filled the role, and Kono will again conduct the BCO at this year's spring concert. The mix of leadership has helped give BCO its "quirky sensibility," says viola player Ana Ruesink, one of the ensemble's founding members. Violinist Sofia Hirsch, who currently heads the musicians' committee, says that while the grant is "a huge, huge boon to the organization," its requirement for matching funds "puts us in a great position for the next couple years," too. "The NEA has been cut so much," Hirsch says of the organization's federal funding, "so we're really lucky to get this honor." 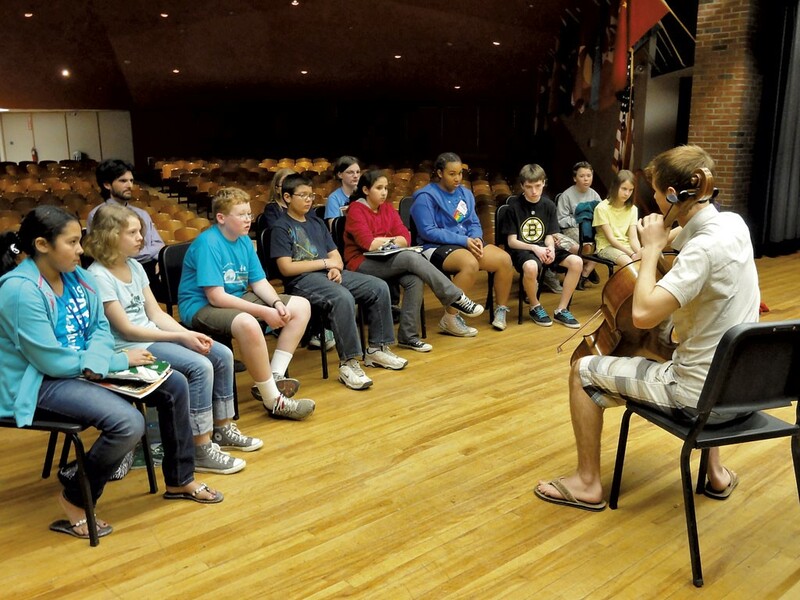 The original print version of this article was headlined "One Grant, One Burlington Orchestra, More Music for Kids"